This hotel is 100PCT Non-Smoking In addition to an impressive array of popular destinations in Cleveland our Independence Ohio Embassy Suites hotel is also a short drive to northeast Ohio*s renowned tourist attractions such as Amish Country Aurora Farm Outlets Blossom Music Center Cuyahoga Valley National Park Geauga Lake Amusement - Water Park Lake Farm Parks Northfield and Thistledown Racetracks Pro Football Hall of Fame and JACK Cincinnati Casino. 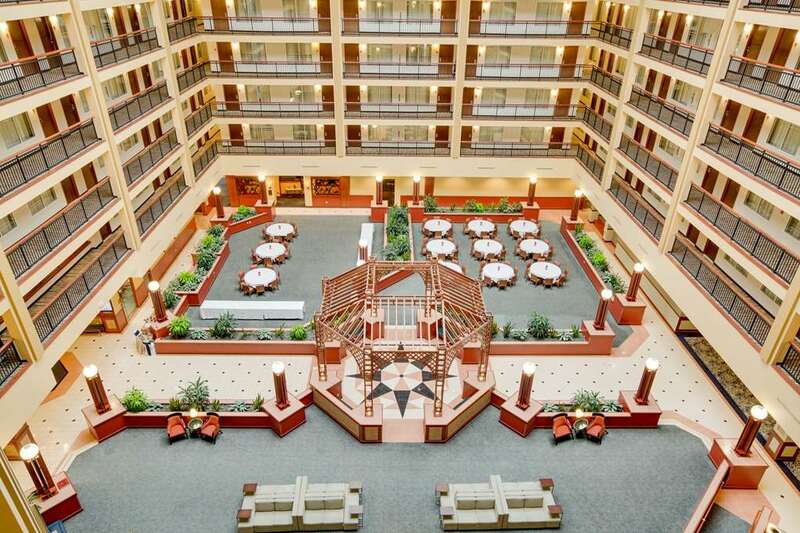 After a long day of meetings or sightseeing during your Ohio travels our southern Cleveland Embassy Suites hotel welcomes you with spacious thoughtfully decorated accommodations and warm Midwestern hospitality. Get a great night*s rest in your comfortable suite featuring extra touches to make you feel at home. In the morning start the day with a complimentary made-to-order breakfast in our atrium. In the evening head to the reception for complimentary drinks and snacks then sit down to a meal at the Embassy Grille one of the top Cleveland restaurants. When searching for the best meeting hotels in Cleveland Ohio reserve your stay at the Embassy Suites Cleveland - Rockside hotel and discover ample accommodations and extensive on-site facilities including more than 12 000 square feet of function space complemented by exquisite service. Book your room online for our Lowest Internet Rate Guarantee. For superb savings be sure to check our spectacular Cleveland hotel deals and vacation packages.